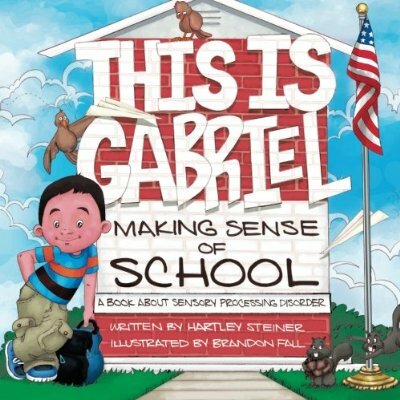 If you have or know a child with Sensory Processing Disorder (SPD), Hartley Steiner's book, This is Gabriel Making Sense of School, needs to be added to your collection. Aside from being beautifully illustrated by Brandon Fall, Steiner breaks down the seven senses: sight, hearing, touch, taste, smell, vestibular and proprioception. While Fall's cool graphics bring each sense to life. Written in clear and simple language, Steiner makes SPD easy enough for everyone to understand. From the grandparent who doesn't really get it, to the sibling or to the "typical" classmate who wants to know "what's up with that kid." Steiner informs the reader without the clinical mumbo jumbo and makes learning about SPD fun and engaging. Ultimately, it's a learning tool for anyone who wants a better understanding of Sensory Processing Disorder. Since receiving This is Gabriel Making Sense of School, I've showed it to all of The Boy's therapists, teachers and some friends. Every single person I showed it to either (a) ordered the book or (b) expressed that they were going to order it. 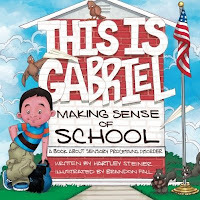 Two behavioral therapists I showed it to agreed that This is Gabriel Making Sense of School would be a great resource book for Inclusion Classrooms. Steiner's book promotes awareness and acceptance. The cool thing about this book is that Hartley Steiner gets it. A mother of three boys (Gabriel, Nicholas and Matthew). Her oldest son Gabriel was diagnosed with Sensory Processing Disorder in 2005. Steiner's personal blog Hartley's Life with 3 Boys is honest, smart and witty. She writes about "the emotional journey of raising three boys, dealing with SPD, Autism and Bi-Polar Adoption, Marriage and Life while trying to keep [her] sanity and sense of humor." Steiner's blog is one that I go to for both support and inspiration. This is Gabriel Making Sense of School may be purchased on Amazon for $13.55. But if you're feeling lucky - you can win it! This giveaway will end Friday, April 29th at 11:59pm EST. Winner will be announced on Facebook & Twitter by Sunday, May 1st. I will contact the winner and you will have 24 hours to reply. Note: Hartley Steiner provided me with a complimentary copy of her book in exchange for being featured on AutismWonderland. The opinions expressed are my own and have not been influenced in any way. I did all 3! I am following you on Twitter, "Liked" your facebook page, and now following your blog. I love all of the things you post and thank you for all of the things you organize. It is so helpful to find other parents who have special needs kiddos (mine has SPD). I would love to add this book to my collection-we have Why does Izzy cover her ears? and Arnie and his school tools. I am a former preschool teacher (only 11 years out of school) and I had NEVER heard of SPD!!! It's so great to know that we are not alone! THANK YOU!!!! Liked your facebook page (Nicole Deleon). And I am now followin your blog...I love the name you created! Can't wait to read the book and show it to others. Especially the grandparents who don't understand. Seems that nobody really does but they simply smile and nod anyway. Thanks! I follow!!! Stay at home mommy of two boys, Trentin 6 & Nathaniel 4. My oldest Trentin has SPD, diagnosed a year ago. It's a learning process for all of us. His O.T. and his Kindergarten teacher have been wonderful! I have been cramming every bit of information I can to help him and the rest of us as well. Soooooo want to have this book! Following you - Tweet: Tweeter. "like" your blog on facebook too! "like" on Fb. Looks like it would be a good book to add to some of the regular classrooms in our schools!